Published on 10 April 2012. 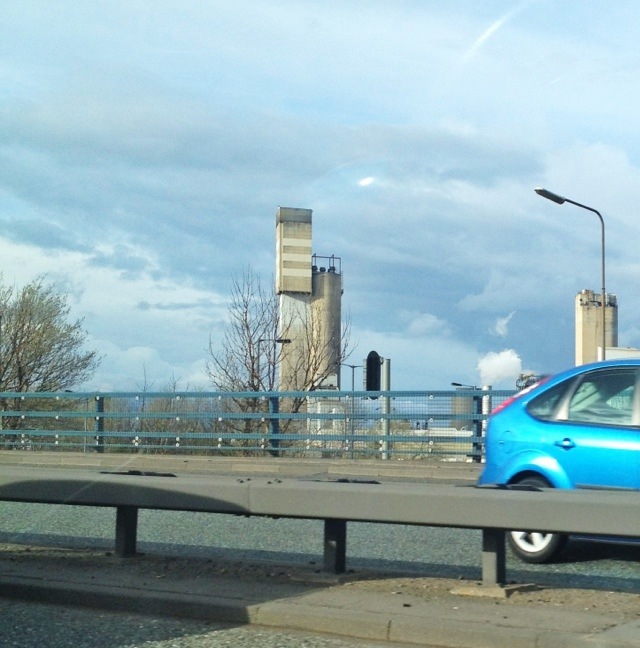 This is the prilling tower that’s part of the former ICI plant at Haverton Hill, in Stockton-on-Tees. Prilling is a process I heard about in GCSE chemistry, yet I never quite believed it was true. Essentially, a chemical (ammonium nitrate in this case) is melted and pumped to the top of the tower, and then released in drops which cool and solidify as they fall, resulting in handy little balls of solid ammonium nitrate to use as fertiliser. It’s reminiscent of the shot towers of the 18th century, and it’s a little bit remarkable that such an early industrial technique is still a common way of producing something. I know that fertiliser is still made at Haverton Hill, but I’m not sure whether the prilling tower itself is still operational. I suspect it probably is, as most of the big industrial sites surrounding it are clearly still active. This 1,598th post was filed under: Photo-a-day 2012, Stockton-on-Tees. Trackback received at 17:52 on 11th April 2012.